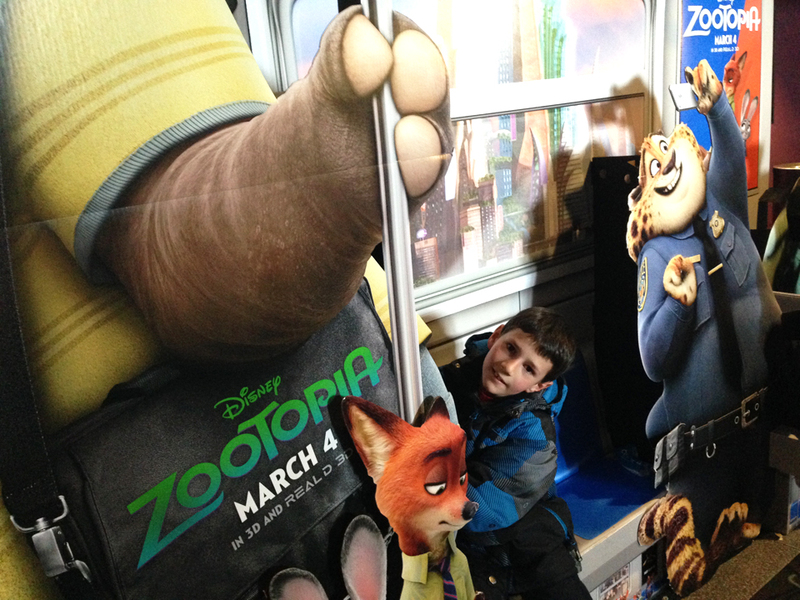 It’s not often I get to review a movie with one of my three nephews after having watched it together. They’re not from around here, so when we do team up, we all watch the movies separately and then have a chat. So far, all three boys (Jon, Isaac and David) helped out with The Lego Movie, Jon and I covered The Hunger Games, and he and Isaac both joined me for The Hunger Games: Catching Fire, The Hunger Games: Mockingjay Parts 1 & 2 and Divergent. Judy bounds out of her hometown, Bunnyburrow, to become the very first bunny cop at the Zootopia Police Department (ZPD). Officer Hopps takes her place alongside a menagerie of other animals, including a buffalo (Chief Bogo, perfectly voiced by Idris Elba), a rhino (Officer McHorn) and a donut-gulping cheetah (Officer Clawhauser, voiced by Nate Torrence). Judy’s relatively small stature doesn’t bode well for her career prospects; while everyone else gets juicy assignments, she’s stuck with parking ticket duty. Judy tackles her role as meter maid with the same zeal that led her out of the carrot patch and into the sprawling mammal metropolis of Zootopia. But it isn’t long before she scrambles her way onto the city’s biggest case: the 14 missing mammals—all predators. Judy enlists the assistance of Nick Wilde (Jason Bateman), a wily fox and even wilier con artist she’s able to hustle into helping her. What follows is an interesting examination of the dangers of judging animals by their species, holding pre-conceived notions about others, and prescribing expectations. When Judy and Nick discover that the missing predators have all gone savage, Zootopia is thrown into unrest, with prey casting sidelong glances at predators. Not that everything was idyllic before the savagery; Judy never reports to work without her can of fox spray, a holdover from her parents’ mistrust of foxes and a frightening encounter from her childhood. Zootopia’s premise is smart, timely and delivered in a very well wrapped package: Bright, bold animations with meticulous attention to detail (David especially liked the way they moved); a tight, witty, highly polished script; and an inventive world in which the animals can roam and romp. The city is built to accommodate all types of mammals. Elephants are served massive (relative to us) ice cream cones served up (somewhat) fresh by the trunkful. Mice scurry through miniature gateways and get dolled up at small-scale (but high-class) hair salons. “I liked it when the guinea pigs chomped on the Pawpsicles,” says David. So did I; the several-tiny-bites-sized frozen treats are made in molds formed by Chihuahua footprints in the snow. Zootopia is a playful, inventive place for Judy and Nick to guide us through a study in race (or in this case, species) relations. The messages are clear, but they extend beyond the obvious “Don’t judge a book by its cover” adage. For example, be careful what you tell people about themselves; they just might believe it. The movie does a good job of challenging assumptions, both personal and structural. “It messed around with your expectations,” says David, pointing out a few instances when the story took surprising turns. He’s right. Almost all of us can attack or be attacked. For an animated children’s film, Zootopia brings a lot to the conversation. As great as it is, though, I thought it missed a couple good opportunities for commentary. Assistant Mayor Bellwether (Jenny Slate), who is a sheep, remarks that Zootopia is comprised of 90% prey. I expected the movie to draw a parallel to the 99%, with most of the prey being smaller and more vulnerable than the predators. But it didn’t. Then there was the highly sexualized Gazelle (Shakira), Zootopia’s mammal pop star. We see enough of scantily clad females in everyday media, put in a position where they’re expected to trade in on their bodies for success or recognition; it would have been nice if Disney hadn’t felt the need to ensnare the film’s only icon in a sequined miniskirt and crop top. I really did like Zootopia, but, for a movie so determined to do away with stereotypes, it sure has its share of them. Like the wolves who can’t keep themselves from chiming in once the first howl is released. And the sloths who move at a, well, sloth’s pace. Mind you, caricaturing sloths led to a priceless scene at the Department of Mammal Vehicles (DMV) when Judy and Nick drop in to pursue a lead. So I’m not complaining… Just observing. In fact, that’s where we first meet David’s favourite character in the movie, Flash the sloth (voiced by Raymond S. Persi). 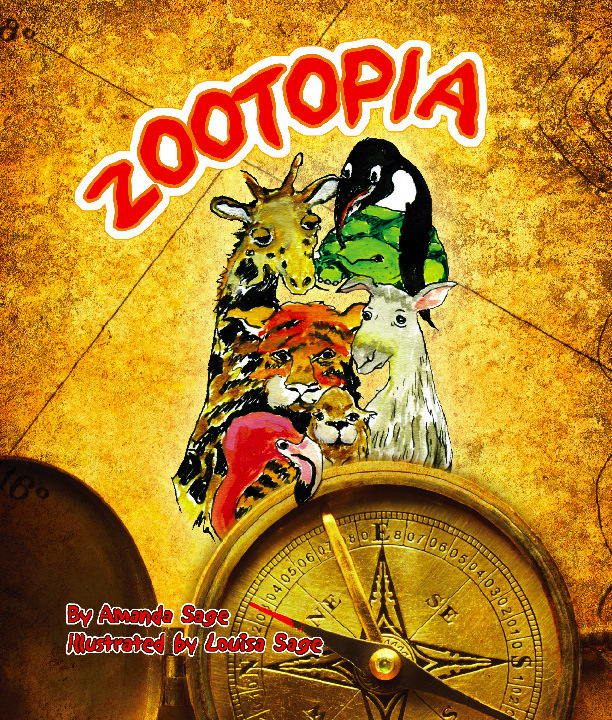 David and I both highly recommend this smart-mouthed, fun-loving foray into the animal world. Overall, it’s creative, delightful and clever, and it presents us human animals with some important things to consider. Oh, and I loved seeing ZTV newscaster Peter Moosebridge, voiced by CBC’s Peter Mansbridge. And you can buy my version of Zootopia, the children’s book available in English or French (Zootopie), right here.